In steel plants reheating furnaces are used in hot rolling mills to heat the steel stock (Billets, blooms or slabs) to temperatures of around 1200 deg C which is suitable for plastic deformation of steel and hence for rolling in the mill. The heating process in a reheating furnace is a continuous process where the steel stock is charged at the furnace entrance, heated in the furnace and discharge at the furnace exit. Heat is transferred to the steel stock during its traverse through the furnace mainly by means of convection and radiation from the burner gases and the furnace walls. It is shown in Fig 1. The charging temperature of the steel stock may range from ambient temperature to 800 deg C. The target exit temperature of the steel stock is governed by the requirement of the process of rolling which is dependent on the rolling speed, stock dimension and steel composition. Steel quality aspects put constraints on temperature gradient and surface temperature. Fuel used in these furnaces can be liquid or gaseous fuel. 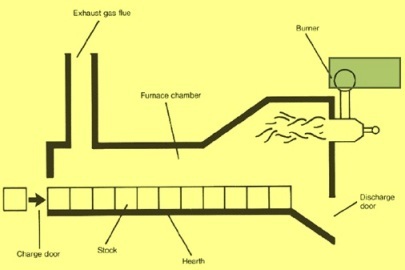 The main features of a reheating furnace are shown in Fig. 2. Fig 2 Main feature of a reheating furnace. The size of reheating furnace is usually expressed as the capacity to supply the rolling mill with sufficiently hot steel from the cold stock and is expressed in tons per hour. The energy efficiency of reheating furnace is usually defined as increase of steel stock heat content when heated from 10 deg C to 1200 deg C divided by the fuel energy (latent heat plus sensible heat) used for it. Many design features of the furnace affects the energy efficiency. These includes i) type of burners ii) Furnace dimensions iii) Number of furnace zones iv) type of wall and roof insulation v) skid design and vi) preheating of fuel and combustion air in recuperators by the hot flue gases coming out from the furnace exit. An efficient furnace is designed in such a way so that in a given time the steel stock as per furnace capacity is heated to a uniform temperature with the least possible fuel and labour. 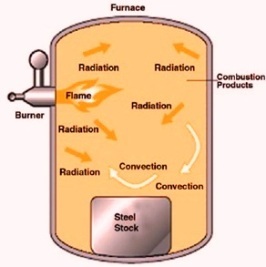 The parameters important for furnace design includes i) the quantity of heat to be imparted to the charge, ii) generation of sufficient heat within the furnace to heat the steel stock and overcome all steel losses, iii) transfer of generated heat to the surface of the steel stock to be heated, iv) equalization of temperature within the steel stock and v) reduction of heat loss4es from the furnace to the minimum. Steel stock of the different dimension, composition and initial temperature may reside in the furnace at the same time. Rolling delays may slow down or stop the movement of steel stock in the furnace. Fuel composition and availability may vary. Burners and furnace internal condition might have degraded. Energy efficiency of a furnace is normally depicted by a Sankey diagram. 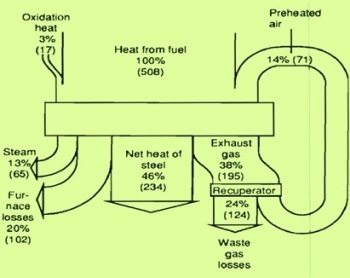 A typical Sankey diagram for a pusher type reheating furnace with cold charging is shown in Fig.3. The reheating furnace classification can be done in several ways. These are described below. Based on the method of heating a reheating furnace can be combustion type or electric type. The combustion type furnace can be oil fired or gas fired. Based on method of charging reheating furnaces can be classified as batch type or continuous type. In batch furnaces the charged material remains in a fixed position on the hearth until heated to rolling temperature while in continuous furnaces the charged material moves through the furnace and is heated to rolling temperature as it progresses through the furnace. Continuous furnaces can be further classified based on the movement of steel stock inside the furnace. Based on this classification the continuous type reheating furnaces are pusher type, rotary hearth type, walking beam type, walking hearth type or roller hearth type. Based on heat recovery, the reheating furnace can be either regenerative or recuperative. Presently only recuperative type of reheating furnaces are in use. Different type of batch and continuous furnaces are described below. Batch furnace -These are the older type of furnaces which are capable of heating all grades and sizes of steel. The steel stock to be heated in this type of furnace is charged and drawn through front doors by a charging machine. These furnaces vary in size ranging from hearths of less than a square meter with a single access door to those with hearths of around 6 m in depth and around 15 m in length and with 5-6 numbers of access doors. Batch furnaces can be operated to heat materials to temperatures around 1320 deg C more satisfactorily than a continuous furnace. They can also be used as a reservoir for holding hot material directly from the primary mill for later rolling in the finishing mill. The disadvantages of batch furnaces are (i) high capital investment per unit of production (ii) low hearth area efficiency (iii) high man hours per ton of heated product (iv) practically no flexibility and (v) limitation on length of pieces to be heated. Higher specific production per unit of space utilized. Lower temperature differences between two pieces of material pushed. More control of the rate of heating at all temperature levels. Gradual rise in temperature permits charging of all grades of cold materials. Rotary hearth furnace – A rotary hearth furnace is used for heating round billets in pipe plants and for heating short length blooms or billets in a forging plant. In the rotary hearth furnace the external walls and roof remain stationary while the hearth section of the furnace rotates. Rotary hearth furnace eliminates the manual labor needed for rolling round billets forward on horizontal or moderately sloped hearth and the disadvantage of excessively sloped hearth in a continuous furnace. This furnace has better means of controlling the rate of heating at all temperature levels when compared with a batch type furnace. The disadvantage of this furnace includes (i) high capital cost per unit of production, (ii) high space per unit ratio, (iii) low hearth area efficiency and (iv) wall refractories and seals at the hearth level need high maintenance level. Walking beam furnaces – Initially walking beam furnaces were designed with alloy steel walking beams which were exposed directly to the furnace heat and were also subjected to heat corrosion. Hence these furnaces were operated at maximum temperatures of 1065ºC. These furnaces were not suitable for heating steels where the temperature of reheat is up to 1320ºC. Presently the walking beam is made of water cooled steel members lined with refractories so that only the refractories are exposed to the heat of the furnace. Alternatively, the beams and supports are constructed of water cooled pipe sections with buttons on the top surfaces to keep away the hot material from direct contact with the water cooled pipes. Walking beam furnaces are now used to reheat billets, blooms and slabs. Pile ups in the furnace and the retention time in the furnace are reduced. It is feasible to empty the furnace from either side by activating the beam mechanisms. Skid marks are no more there since there is no line contact with water cooled skids. Better hearth utilization can be obtained when charging mixed sizes by selecting the proper number of walking beams. There is potential available for the extension of overall furnace length to improve the utilization of furnace waste gases and to reduce fuel consumption. The disadvantages of walking beam furnaces are (i) system complexity, (ii) high capital cost, (iii) high maintenance of hearth seals and hearth refractory and (iv) the problems caused by the scale that drops off during the heating of the material. Walking hearth furnaces – It is similar to the walking beam furnace when passage of steel stockl through the heating chamber is considered. The difference in method of conveyance in these two furnaces is that in the walking hearth furnace the steel stock rests on fixed refractory piers. These piers extend through openings in the hearth and their tops are above the hearth surface during the time when the material is stationary in the furnace. The furnace gases can thus circulate between most of the bottom surface of the work and the hearth. For movement of the material toward the discharge end of the furnace, the hearth is raised vertically to first contact the material and then raised further for a short distance above the piers. The hearth then moves forward a preset distance, stops, lowers the material on to its new position on the piers, continues to descend to its lowest position and then moves backward to its starting position toward the charging end of the furnace to await the next stroke. The advantages and disadvantages of a walking hearth furnace are similar to those of a walking beam furnace. It has ability to handle very long pieces. The zone control in this furnace is simpler when cross-firing is employed. Material suffers little or no mechanical damage. Skid marks are not there. Roller hearth furnace is self emptying. The disadvantages of the roller hearth furnace include (i) high initial cost per unit of capacity, (ii) If the rollers are not properly insulated there is increased heat loss due to the water cooling of the rollers and (iii) roller hearth furnaces are narrower and longer than pusher type or walking beam furnaces of the same capacity. Single zone firing is associated with higher scale losses. Single zone fired furnaces have greater tendency to cause decarburization of high carbon steel than the top and bottom fired furnaces because the steel is exposed to furnace gases with hydrogen and water vapor combinations for a longer duration. The scaling of steel is practiced sometimes deliberately to remove the decarburized surface layer. The furnaces with top firing have longer hearths for equal production when compared with furnaces having top and bottom firing. Side discharge furnaces have less air infiltration at the hot end than end door discharge furnaces. End door discharge of the usual gravity type induces cold air into the furnace by the chimney effect at the discharge end of the furnace. However end door discharge is mechanically simpler for removing the heated material. A level hearth eliminates the chimney effect of hearths sloping upwards towards the charging end. This chimney effect draws cold air into the furnaces at the hot end and therefore causes higher fuel consumption and scale losses.